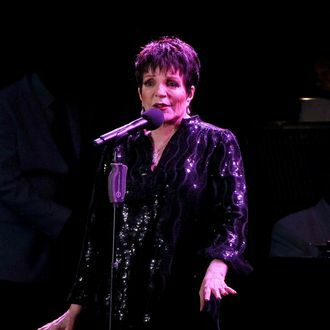 Liza Minnelli will guest-star as herself in the upcoming season of Smash. As part of the appearance, Minnelli will sing an original song with series regular Christian Borle written by composer-lyricists and executive producers Marc Shaiman and Scott Wittman. Her episode, “The Surprise Party,” will air mid-season this spring. “Liza Minnelli is the essence of a multi-talented, singular show business sensation, particularly for her extraordinary contributions to Broadway,” NBC Entertainment chairman Robert Greenblatt said. “So what could be more fitting than to have her legendary talent on a show that celebrates a world Liza has dazzled for decades? I had the pleasure of working with Liza when we restored her landmark television special ‘Liza With a Z’ at Showtime, and to see her artistry up close and personal is a thing to behold.” Smash returns Feb. 5. The second season will also feature previously announced guest stars Jennifer Hudson, Jesse L. Martin, Sean Hayes, and Bernadette Peters.